The first foodie revelation I had in Vietnam wasn’t food; it was a beverage. And it laid the groundwork for my meals for the rest of the trip. Even though I am not a coffee connoisseur by any stretch of the imagination, in the last year I’ve lucked my way into two coffee tasting sessions (Peoples Coffee and Gravity Coffee). Apart from learning how to brew coffee, different flavour notes (and I can barely detect them! ), I also learnt a little about coffee growing regions. I was surprised that Vietnam is the second largest coffee producer, and has a massive domestic consumption. I finally figured out why. 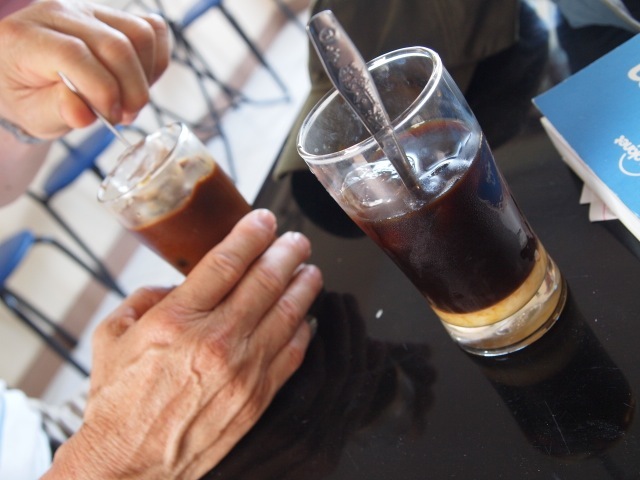 Cà phê sữa đá is coffee with sweetened condensed milk (sữa) and ice (đá). The condensed milk is added to the base of the glass, to which filtered coffee is added to about half full and it is thinned out with ice, which melts quickly in the heat. Vietnamese coffee is filtered using equal amounts of hot water to powdered coffee resulting in a thick and strong brew. I found the coffee in Vietnam to be highly aromatic with no hint of bitterness. Just rich and flavoursome, and in no small part to the sweetened condensed milk which added a mellowness to the brew. A glass of cà phê sữa đá ranges from VND15,000 to VND25,000 (NZD$0.70 -1.50).